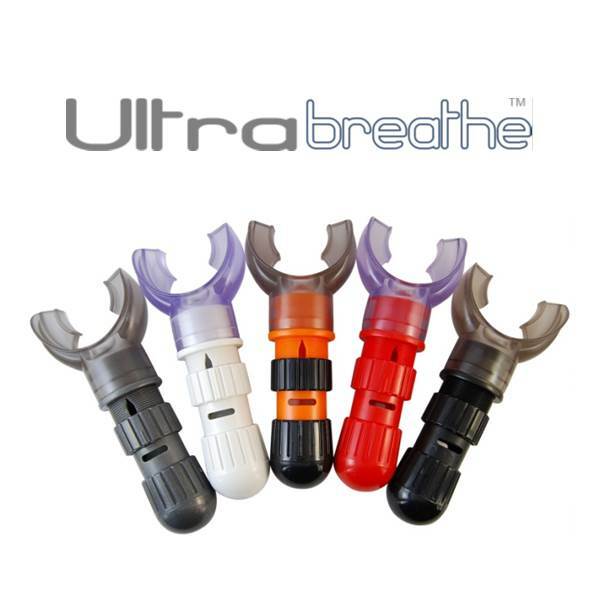 Ultrabreathe™ is a highly effective inspiratory muscle trainer, providing an easy and convenient means of increasing the strength and durability of the respiratory muscles. Do you ever feel a shortness of breath from simply walking up a flight of stairs? Would you like to gain better lung stamina during vigorous workouts? Thanks to the Ultrabreathe, you can relieve the symptoms of breathlessness by giving your lungs a daily workout from the comfort of the armchair. 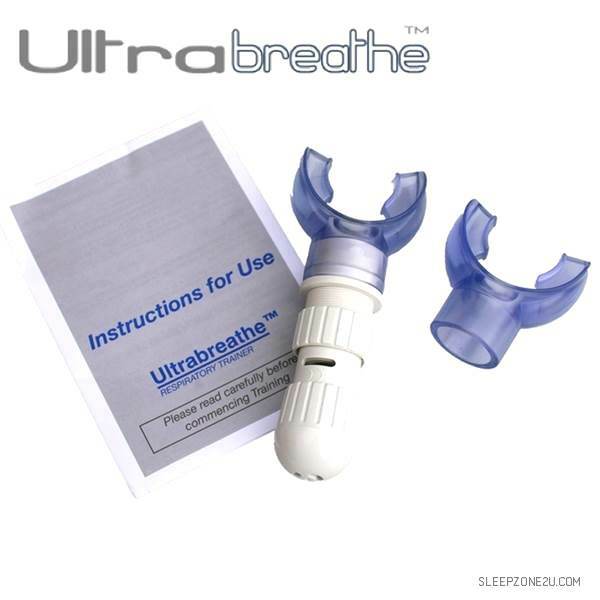 Just inhale through Ultrabreathe for a few minutes twice a day in a simple breathing pattern as shown in the instructions. Ultrabreathe works on the principle of resistance. As you inhale, the resistance created makes your respiratory muscles work harder, and the harder they work the stronger and more durable they become. As your breathing power improves, Ultrabreathe can be gradually adjusted to provide more resistance with just the twist of a knob. It can even help reduce the feeling of breathlessness from some lung diseases such as asthma, bronchitis and emphysema. Doctors have been prescribing big, bulky breathing devices for post-surgery patients to increase their lung power for years. Ultrabreathe gives you the same effects, but is so small and compact you can take it with you to exercise your lungs wherever you are. Athletes who want to boost their performance and folks who suffer from breathlessness can all benefit from using this ingenious breathing exerciser. Whether you're exercising for cardio fitness, sports or not at all, you'll breathe deeper and more easily than ever. Within a month you will be on your way to feeling the wonderful effects of strong, healthy lungs! The patented Ultrabreathe is used by athletes, sportspeople, singers and musicians the world over to supercharge their inspiratory muscles. Warm up: Supplement your usual routine prior to full body workout or competition - traditional techniques tend to ignore the breathing muscles. Performance: Follow our training regime for just 5 minutes per day to boost pulmonary capacity and endurance. Increase the resistance as lung function improves - and take advantage of the patented adjustable valve system which lets you select the moment resistance is experienced on inhalation. ► After positioning the soft mouthpiece between the teeth and gums and biting down to create an airtight seal, the user breathes in sharply and continues to breathe in hard for as long as possible. ► Then the breath is slowly exhaled. When repeated 25 times, twice daily, for at least a month, the exercises should noticeably increase breathing strength. ► As improvement occurs, the user can increase resistance by simply turning one or both parts of the device: the end cap (which holds a lightweight ball) and the valve sleeve. Did you know that recent research indicates a connection between trained respiratory muscles and reduced lactate levels? Boutellier et al found that: - respiratory training significantly increased the endurance time of respiratory muscles - respiratory trained subjects had lost the sensation of breathlessness - blood lactate concentrations were reduced during post training exercise. Further details regarding clinical research into IMT (inspiratory muscle training) can be found by clicking here. 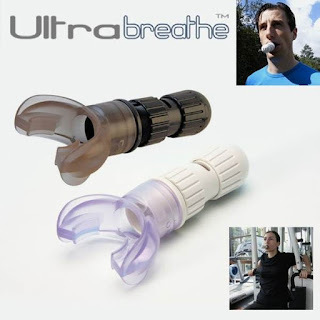 Patented Inspiratory Muscle Training (IMT) device. CE marked and registered with the UK MHRA and FDA as a Class 1 Medical Device and is included on the NHS Drug Tariff. Manufactured in the UK. 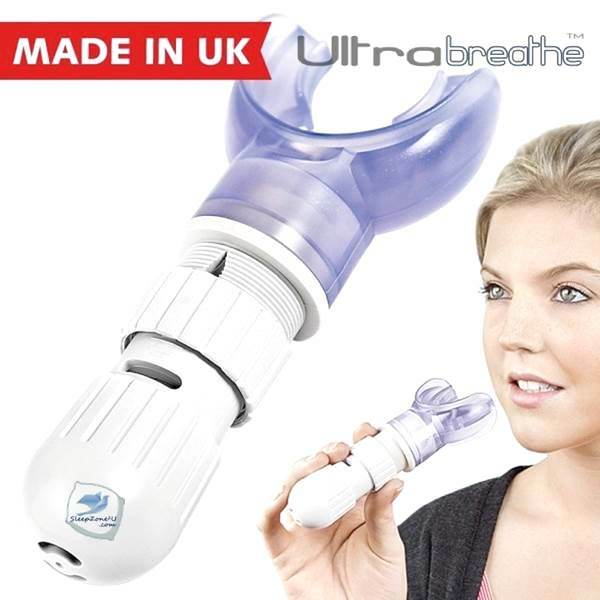 Ultrabreathe by Tangent Healthcare Ltd.
All products are "CE" marked along with "Made in UK". Ultrabreathe' is a trademark of Tangent Healthcare Ltd, UK. First manufactured in 1997 and since then over 350,000 have been sold world-wide. 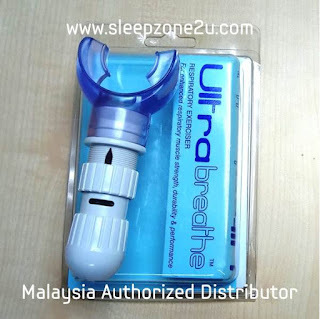 Contraindications: Used correctly the Ultrabreathe can be used by almost anyone and has no harmful side effects. Very occasionally, however, there may be instances in which the creation of a large negative pressure in the chest may exacerbate an existing condition. As such, if you are on medication, suffer from a medical condition (asthma for example), or are uncertain as to whether the Ultrabreathe is suitable for you, then you should consult your doctor prior to commencing training. Above all, unless advised by your doctor, you should not stop taking any medication - the Ultrabreathe is intended to complement existing treatments, not replace them.